Ever since I went gluten free, I find myself cooking a lot more meat than I ever have before. This has been a real learning experience for me, and boy have I learned a lot! Pork loin chops have become one of my staples. With the cost of meat being what it is, it's important to look for bargains. 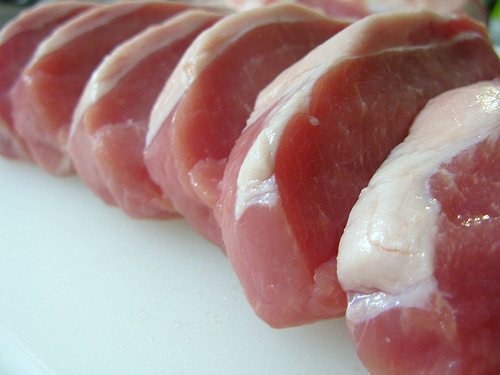 I guess pork loin chops are not very popular, because they are usually cheaper than almost any other cut of pork. And frequently on sale, to boot. I'm not sure why pork loin chops sell so poorly. They are more tender than regular pork chops, and don't have that messy bone to chew around. Plus, being thicker, I find them easier to cook without overcooking. However, as with all meat, a meat thermometer is key. I finally shelled out the fifteen dollars for one of the fancy kind. It has a probe you stick in the meat, and a cord that dangles out of the oven door to a sensor. You can set an alarm to go off when the temperature reaches a certain point, or set the timer by minutes and hours. And it's very easy to use, read, and set. Plus it's magnetic, so you can stick it to the front of the oven. It's a bargain, and a lifesaver. Instead of butter, I use olive oil because it's healthier. (Or so I am led to believe.) I add at least a cup of liquid in the deglaze, because I like to have lots of broth at the end. I bake the meat for a lot longer, because I use thicker cuts. It's probably more like 15 minutes at 450; I don't really pay attention, I just go by the internal meat temperature. This recipe results in thick juicy pork loin chops which are properly cooked, yet moist and tender. Wonderful! And finally, I serve it over a bed of brown rice. The brown rice soaks up the juice in a most delicious fashion, and provides a lot of good nutrition to boot.